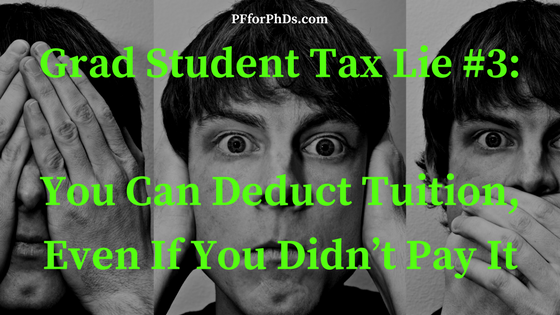 Grad Student Tax Lie #3: You can deduct tuition, even if you didn’t pay it. This tax lie is wishful thinking gone greedy. Not only are you ignoring the scholarships you received to pay your tuition and required fees, but you are trying to take a tax break on the tuition and fees you didn’t pay! To prepare an accurate tax return, you must account for both your scholarship income and your qualified education expenses. Omitting one or the other from your calculations will take you wildly off track. Your 1098-T, if you receive one, is a useful resource for figuring out the qualified education expenses paid on your behalf. (But don’t forget about the qualified education expenses you may have paid that didn’t flow through your student account, like required textbooks.) However, the definition of qualified education expenses differ with the educational tax benefit you are trying to take, so the definition the university uses may not match the definition you want to use. The 1098-T may or may not also include your (full) scholarship and fellowship income, so it’s worthwhile to go into your student account and check up on all the scholarships given to you and all the charges against the account. You will definitely have to do that last step if your university did not generate a 1098-T for you. The goal is to have your 1040 accurately reflect your taxable income, not to lower your tax burden by making it look like you paid your own tuition if you didn’t. Try to keep reality forefront in your mind!